JAI’s Sweep + Series The Sweep+ Series comprises 3-sensor R-G-B and 4-sensor R-G-B-NIR line scan cameras for industrial machine vision applications. They features state-off-the-art prism technology providing the best possible performance, precision, and versatility for line scan imaging in continuous production flows. Sweep+ Series cameras equipped with four CMOS sensors are designed to simultaneously capture R-G-B color image data in the visible light spectrum and image data in the near infrared (NIR) light spectrum. With efficient manufacturing facilities and reliable and durable technology, these color line scan cameras are available at good price/performance points offering low cost of ownership and supreme color line scan image quality for the most demanding machine vision applications. 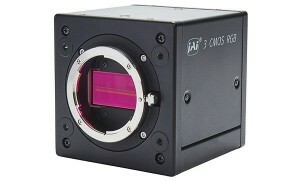 4-CMOS technology provides simultaneous imaging of R-G-B visible light and near infrared (NIR) light. A single optical plane simplifies camera positioning and encoding tasks.